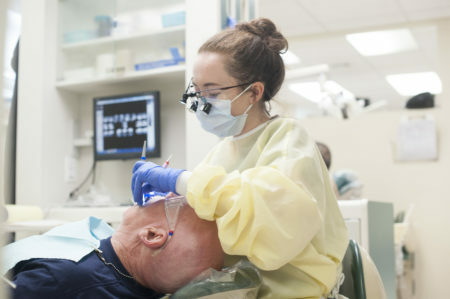 Manor College Dental Hygiene Program is proud to offer a training course to prepare licensed dental hygienists for certification in administering local anesthesia. This course has been approved and satisfies the didactic and lab experiences required by both the PA and NJ State Boards of Dentistry regarding administration of local anesthesia for dental hygienists . Participant is required to complete the registration form and mail it with the necessary payment and supporting documentation to the address shown at the top of the registration form. A completed registration form (with full payment and documents) is required to reserve a seat in the training course. Registration is accepted on a first come basis. Registration is not complete without supporting documentation and full payment. To provide the necessary knowledge and skills to successfully complete the training course and to apply for a state license to administer local anesthesia in approved clinical settings. Participant is expected to purchase the textbook and bring it the first day of class. This is a very content-intensive course; therefore, it is strongly recommended the student begin to read the first several chapters of the textbook prior to the first day of the class. Lecture outlines, copy of PowerPoint slides and other handouts will be provided. Attendance mandatory for the entire length of the course. No credit will be awarded for partial completion of the course. Upon successful completion of the clinical competencies and written final examination, the participant will be issued a Certificate of Completion and is eligible to apply for a state license to administer local anesthesia. Certification is not guaranteed. Note: The training course is NOT eligible for continuing education credits in PA; however, the course is eligible for continuing education credits in NJ. $1300 for the 4 session course. Lunch is on the student’s own time. Class size is limited to allow for direct faculty supervision. Participants who fail to submit the required documentation as stipulated will be disqualified from participating in the course and will not be issued a refund. The Dental Hygiene Program will provide the necessary disposable items for the clinical component of the course. Participants are required to provide a suitable lab coat, scrub set, socks (crew-length), all-leather clinical shoes, safety glasses, dental supplies and items listed below. The Dental Hygiene Program adheres to OSHA/CDC/ADA guidelines for safety and infection control. There is no eating or drinking in the clinic and safety glasses must be worn by the patient and operator during patient care. *Manor College will not be responsible for lost or missing items; be sure to mark all items by using a color-coded band or etching the participant’s name on the instrument. There is no refund for withdrawing within 14 (fourteen) days of the first class or for withdrawing after the course begins. Participants may receive a partial refund for withdrawing in writing 2 weeks before the first day of the course. However, participants who withdraw will incur a withdrawal penalty fee resulting in a maximum refund of $600). Caution: Questions about a possible medical issue MUST be discussed with the Course Coordinator prior to registering for the course. No refund will be issued for failure to obtain Course Coordinator permission for a substitute patient if there is a potential medical issue that precludes the participant from receiving local anesthesia. Refer to the informed consent policy described herein. Manor College reserves the right to cancel the course. If the course in cancelled by Manor College, participants will be issued a 100% refund. And other instructors and teaching assistants as needed. *Note: not all instructors teach at each course.